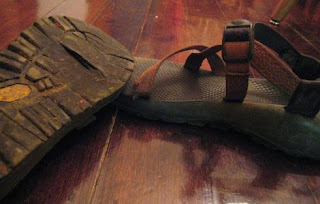 Alas – the end is near…for my favorite sandals. I knew that the tread was almost worn down completely. I knew that the straps were beginning to fray. But yesterday, as I was sitting in a meeting and absentmindedly pondering my muddy feet (it’s a condition they are often in here in Ukarumpa. Dirt roads+rain+sandals = muddy feet), I was dismayed to see that the sole of one of my sandals has actually begun to split open. These aren’t just any sandals. If I remember correctly, I bought them in 2003. I wore them every single day of the two months I was in Indonesia. They were my favorite summer footwear in the States for 6 years. They have traveled with me across 5 countries. But their glory days have come to an end. I’ll probably still keep wearing them until they fall apart completely. Luckily, I had the foresight to know that this time was coming, so last year I bought a replacement pair of Chacos. But I’ll still miss my red ones.